In basketball, the frontcourt is the half of the court on which the team with possession of the ball is attempting to score and is also known as that team’s offensive end of the court. The backcourt is the half of the court that the team with the ball advances the ball from into the frontcourt. Once possession changes, the frontcourt becomes the other team’s backcourt and vice versa. These terms also make reference to specific positions on a basketball team. The small forward, power forward and center are collectively designated as a basketball team’s frontcourt. Typically, these players play near the baseline, which is the out-of-bounds line under each basket. On offense, these players constantly move from one side of the key to the other in an attempt to free themselves to take an open shot. When used in relation to these players, the term frontcourt usually refers to their offensive responsibilities, but also carries implications to the players they defend. A point guard and shooting guard are collectively referred to as a basketball team’s backcourt and are commonly the players that advance the ball into the side of the court on which their team is attempting to score. The shooting guard is typically responsible for scoring the most points between the two guards, while the point guard is expected to create plays by passing the ball to open players, such as the forwards and center. Usually, these responsibilities vary based upon the type of defense the opposing team uses and on the strengths and weaknesses of particular opposing players. 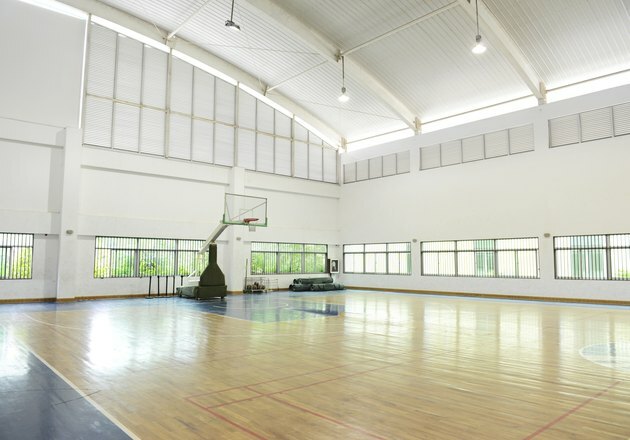 The backcourt and frontcourt areas of a basketball court are separated by the midcourt line and are equal in dimensions. At the college and professional levels, the frontcourt and backcourt are an identical 47 feet long and 50 feet wide. At the high school level, they measure 42 feet long and 50 feet wide. A court’s baseline and sidelines indicate the outer boundaries of the backcourt and frontcourt. During the flow of a game, the rules dictate when each team can possess the ball in the frontcourt and backcourt. Once a team advances the ball into the frontcourt, the ball may not cross back into the backcourt without incurring a penalty unless the ball is batted or tapped into the backcourt by an opposing player. If a player advances the ball into the frontcourt and then crosses back into the backcourt, a backcourt violation is called and the offensive team loses possession of the ball. If the offensive team fails to advance the ball into the frontcourt within an allotted amount of time, the team also loses possession of the ball. This allotted amount of time varies between the levels of play.